For ten years, this ordinary Nepali man’s photo has been a rallying call for documentary film-makers across South Asia, home to one fifth of humanity. 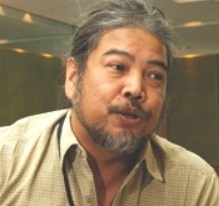 He has become the symbol, and the logo, of Film South Asia (FSA), a regional film festival organised every other year in Kathmandu since 1997. 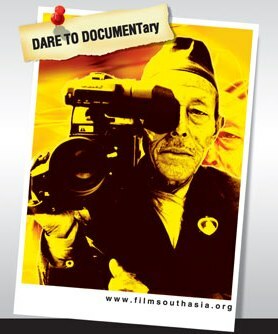 FSA, whose latest edition rolls out in the Nepali capital this week (11 – 14 October 2007) is the leading and most enduring film festival that brings together South Asian film-makers and film-lovers. 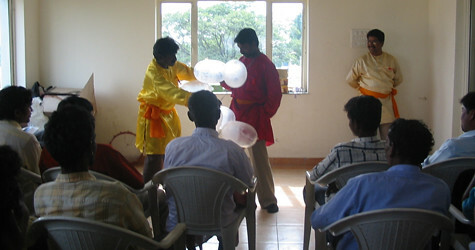 It is a low-budget, high-energy festival organised by the non-profit Himal Association. Having been associated with FSA from the beginning (I was on the first festival’s jury, and have hosted a couple of travelling festivals since), I was curious about who this old man was. On a visit to Kathmandu last month, I asked FSA Chairman and documentary champion Kanak Mani Dixit about it. It turns out that the FSA logo is derived from this photo, taken of an ordinary Nepali called Ram Bahadur Tamang. Photocredit goes to Cory R Adams. Ram Bahadur belonged to the Tamang people, who are believed to have migrated to Nepal from Tibet. Today, the Tamangs reside mainly in the high hills north of Kathmandu. Perhaps inspired by my query, Kanak has written up the story behind the photo/logo in his column On the Way Up in the latest issue of Himal Southasian which he edits. Not much more is known about old Ram Bahadur. He had moved on shortly after this picture was taken. We don’t know, for example, if he ever actually used the Sony camera, or was just playing with what, at the time, seemed a high-tech curiosity. This was, after all, the early 1990s when video cameras were not quite ubiquitous. In my personal tribute to Anita, written shortly after her untimely death on 10 September 2007, I touched on her extraordinary skills as an activist-communicator. It was in connection with a global television series that I last met Anita in person. In the summer of 2003, I was invited to join a small group of people at Anita’s country home, Highfield House, in Arundel, Somerset, England. It was a one-day brainstorming on the future of Hands On, a global TV series that she’d been hosting for three years. Hands On stood out as a beacon of hope amidst so much doom and gloom on television -– it featured environmentally-friendly technologies, business ideas and processes that have been tried out by someone, somewhere on the planet. It covered a broad range of topics, from renewable energies, waste management and information technology to food processing and transport. The aim was to showcase good news and best practices so they could inspire others — entrepreneurs, communities or even governments — to try these out. The series was first broadcast on BBC World and was redistributed to dozens of TV channels worldwide through my own organisation, TVE Asia Pacific, and others. It was backed by the reputed development agency Intermediate Technology (now called Practical Action). Anita brought her usual passion and dynamism to our discussion, energising the development and communications professionals enjoying her hospitality. Covering good news was already going against the media’s grain, but it was harder to keep at it year after year, especially when the media landscape was changing rapidly. It was a challenge to stay engaged and relevant to viewers across Africa, Asia Pacific, Latin America and Europe. Always fond of analogies, I likened Hands On to Arabian Nights, which, according to legend, a young woman had spun from her rich imagination for 1,001 nights to save her life from an evil king. In Hands On, I suggested, we are telling stories to save not one life, but all life on Earth. She challenged everyone at that meeting to make Hands On more interesting to younger viewers in different cultures. We recognised that offering one media product to a global audience was a tough sell: most people prefer a home-made, local story. But then, she’d built the entire Body Shop chain with a largely common product offering, even if raw materials were sourced from different parts of the globe. She never imposed the Body Shop experience on our meeting, but it was sometimes instructive to look at how a globally available product could still be localised. This is just what we did in the months and years following the Arundel brainstorming. 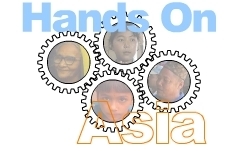 We rolled out the ‘Localising Hands On in Asia’ project, which saw several dozen Hands On stories being versioned into local languages and distributed through broadcast and narrowcast means in Cambodia, India, Laos and Nepal. The two-year project, generously supported by Toyota, was hugely successful in delivering the Hands On stories to millions of people who would never have been exposed to it in original English. We were thrilled when our localising work inspired similar local TV shows in three countries (Cambodia, Nepal and Laos). Yet it was the narrowcast outreach that was more rewarding. Coming soon: Who killed Hands On, one of the most successful multimedia initiatives in recent years to communicate development? On 19 July 2007, I wrote about the need for natural history and environment film-makers to take their films back to the locations and communities where they filmed. I cited the specific example of the Brock Initiative, started by ex BBC Natural History producer Richard Brock, which is supporting projects in several countries in Africa and Asia. In today’s mail, I received the DVD of Tiger – the death chronicles, the latest documentary by the award-winning Indian film-maker Krishnendu Bose. I’m going to watch and write about it separately, but this reminded me of the outreach work he and his company, Earthcare Films, have been doing for years. After working for a dozen years with factual film-makers from across Asia, my experience is that not many are really interested in any outreach besides a high profile broadcast. For sure, broadcasts help draw attention to a film and its creator/s. But as we have discussed in recent blog posts, broadcast television is not an ideal platform to get a discussion going on issues and concerns. In fact, many film makers are finding it harder to get their serious films broadcast at times with better audience ratings. Still, surprisingly few film-makers have time or patience for serious narrowcast outreach. Yes, it is a time consuming, tedious process. The logistics can be demanding and expensive. And there is not much glamour (or ‘arty and intellectual feel’) in going to a small town or remote village and playing back your film to a few dozen people living on the edge of survival. But as exceptional film-makers like Krishnendu (in photo above, taken from Earthcare Films website) know well, it can be an enormously enriching and satisfying experience for a film-maker. People like him watch the audience while they watch the film. 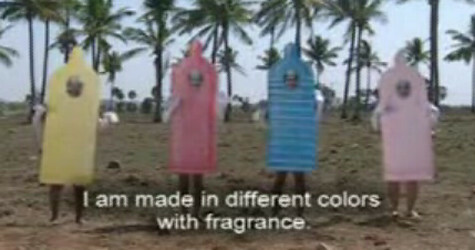 “Films are a greatly underused communication form. Serious communication usually is at most limited to awareness building,” says Earthcare Films website in its section on outreach. For the past several years, Earthcare Outreach has been active on these fronts, organising mobile film screenings or traveling film festivals in rural and urban areas in different parts of India. The website talks about how they have held community and citizenry exchanges between selected locations, evolving film-making skill-share across these groups. Read more about Earthcare Outreach activities. On a personal note, I’m trying to recall when I first met Krishnendu. It must be at least a decade ago — I had seen some of his work before I met the man behind them. We were together as guests of the Earth Vision Tokyo Global Environmental Film Festival in 2001 — where his film, Harvesting Hunger, (image below shows it being filmed) won a special jury award.